With an extensive range of stylish and quality designer tapware in our Gold Coast showroom, you’re sure to find the perfect fit for your needs. 30 years ago in London, England, Bob Perrin & Greg Rowe had a vision to manufacture the highest quality classical kitchen and bathroom taps. Their determination was to blend original design with engineering excellence. They wanted to inject style, creativity and desirability, use the best materials and precisely control the manufacturing process. The Perrin & Rowe brand became recognised as the world leader in premium quality classical brass tapware. 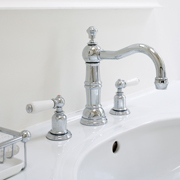 Unlike many tapware brands, Perrin & Rowe has not moved its factories to Asia. All Perrin & Rowe products are still made in England in an environment that treasures its staff, promotes family values and concentrates on the perfection of each product it designs, makes and delivers. each product item will stand the test of time.